Welcome to the world premiere of the Alfa GT Coupé, a new car derived from the Alfa 156 and due to go on sale at the end of this year. The model was designed by the Bertone Style Centre and offers original styling and exhilarating performance. It also represents a brand new concept of sportiness that blends comfort and elegance. The car aims to offer all the driving satisfaction of an extraordinarily high-performing no compromise coupé. The Alfa GT Coupé succeeds in packing the results of Alfa's superlative engineering heritage into a shape inspired by a sense of style and flair that could only be Italian. The stylists were also able to call on a great Alfa Romeo tradition that has brought us models that remain benchmarks for the category: the 1900, the Giulietta, the Giulia and the Alfetta. With a length of 4.48 metres, width of 1.76 metres and a height of 1.39 metres, the Alfa GT Coupé is aggressive and compact (its wheelbase is 2596 millimetres), with a shape marked by certain distinctive traits that define its strong personality and render it immediately recognisable. The shield, for example, is an imposing presence from which the entire car appears to unfold. Located in the middle of the front, the shield is created by an overlapping of the protective strip built into the black grille. The extremely effective result oozes power and aggression.This impression is reinforced by a great black mouth and light clusters that are objects of beauty in their own right. The equally distinctive profile gives the model the appearance of an agile, solid and protective car. This is due above all to a pronounced shelf on the side that makes the car look slender and dynamic. The rear end also has a lot to say stylistically. The tail end of the Alfa GT Coupé is compact and slightly dipped and tapering with large built-in bumpers. The rear window is drop-shaped while the light clusters are embedded in the body. The exterior shape is as sporty as Alfa Romeos get and also emphasises the attributes of a reliably spirited car that is easy to control and capable of offering great driving satisfaction. 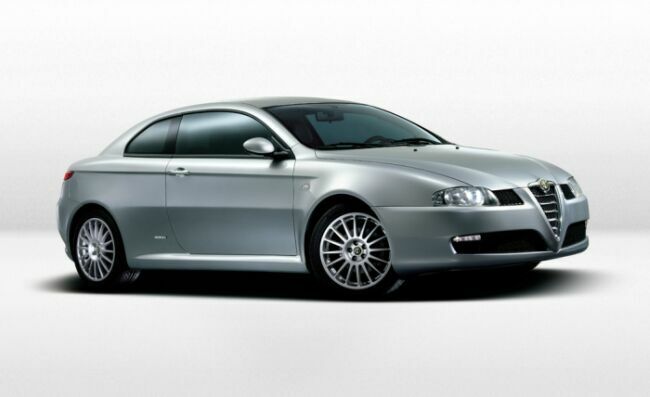 The car owes its performance to a mechanical layout that has borrowed the very best features from the Alfa 156, including three generous power units, each with one of the best specific power ratings in its cylinder capacity category: the 140 bhp 1.8 T.Spark, the 165 bhp 2.0 JTS and the 140 bhp 1.9 JTD Multijet 16v. Customers who want the very best in terms of performance and sportiness can choose a GTA version equipped with a powerful 250 bhp 3.2 V6 24 valve engine.